A new high-yield, disease resistant forage oat variety has been released this year. It was developed by plant breeders from the Queensland Department of Agriculture and Fisheries at the Leslie Research Facility in Toowoomba. Queensland Agriculture and Fisheries Minister Leanne Donaldson said the new variety is the pinnacle of seven years of research by the Department’s scientists to develop a crop completely resistant to all known strains of leaf rust. Over four years of trials, Wizard has achieved a nine per cent improvement in total forage yield compared to Aladdin and Genie which have been the benchmark varieties for growers in the northern regions. The new line produces vigorous growth early in the season, and recovers quickly from grazing to produce high forage yield for fattening cattle during the winter months. The value of the liveweight gain produced from this feed source by the beef cattle industry each year is estimated at $250 million. Forage oats are also an important feed source for the dairy, sheep and horse industries. Funding for the forage oats breeding project is jointly provided by the government and its commercial partner, Heritage Seeds, which will market Wizard in Australia in 2017. More information about planting, nutrition, diseases and treatment is available in the 2016 Forage oat variety guide which is available online at www.daf.qld.gov.au or by contacting the Department of Agriculture and Fisheries on 13 25 23. 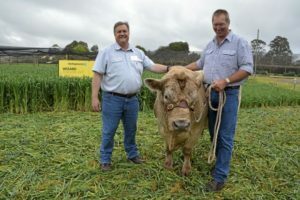 Senior plant breeder (oats) Bruce Winter and senior experimentalist Richard Uebergang with bull Hercules at the Leslie Research Centre in Toowoomba.